Whether you need to get rid of some clutter, find a bargain or just shop around, the Internet is great for classified ads. However, a lot of people never get past using the selling giant eBay, when in fact there are other sites and apps out there which do much the same and often for less. Just like the classified ads in newspapers, fun and free apps like OLX make it super easy to find people’s goods for sale or list your own adverts. OLX is on multiple platforms but the Windows Store version is arguably strongest, as it fits the tiled theme of Windows Metro very well. This app gives you access to several classified ads listings in multiple cities, with a system much like that of eBay or Gumtree. Users can post items for sale, or browse and buy. Each advert has a description, a photo where applicable, a price, location and category for easy searching. Locations can be clicked to compare them to your map app. Best of all, it’s free to post an ad on this app so it’s ideal for sellers, even out and about on the go. You can easily import photos of the goods for sale from your device’s camera too, if you use tablet or mobile. There are listings for just about everything, from antiques to television sets. OLX is notably user-friendly. 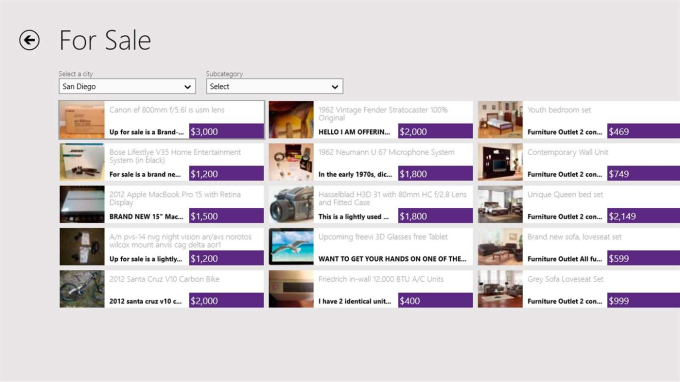 You can snap a photo, add a description and category data and have it up for sale in minutes. Everything is clearly labeled and easy to find, with an intuitive layout that uses the Windows Metro style of tiles and columns. These big buttons are impossible to miss and look good. Some may miss the more artistic style of apps that use their own layouts, but for ease of use this is perfect. For example, when picking a category, you just have a big set of clear, color coded tiles for jobs, general sales, classes, vehicles, services, real estate and community. You then have a drop down menu of subcategories if you need to be more specific. Managing your ads and your purchases has been made simple too, all taking place in the ‘My’ section of the app, where you will find a mailbox, any favorites that you’ve tagged and lists of your ads. Everything is easy to find and is optimized to work in landscape mode. im using olx on my ipad and ive got no problem selling my stuffs.. very useful. i want to use it every time i need something for my house and car. better to sell or purchase used products.. its agood application to sell or purchase used goods or anything. What do you think about OLX for Windows 10? Do you recommend it? Why?